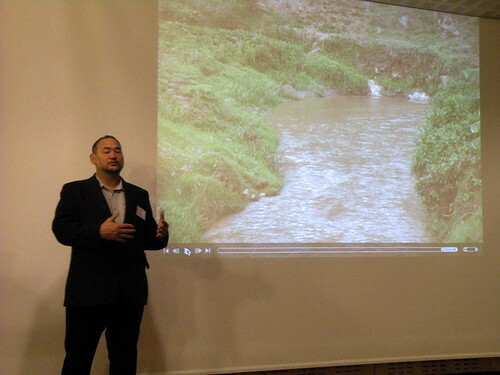 I attended a talk by John Lui at the CEESA Educators’ Conference in Tallinn, Estonia. He gave a talk on his restoration of a highland wetland in Rwanda. Jarod Diamond gave the reason of the genocide was a fight over scarce resources. He was working at the head waters of the White Nile and Congo River, and environmental problems at that highland, it affects all the way down the river basins. All of these horrible events are caused by deforestation by humans. He feels this is the “panda” of biome restoration. This is an extremely beautiful place with rare orchids, birdlife, volcanoes, lakes, etc. This is also a place that is coming out of genocide. Plants are 80-90% water and when they are removed from a hillside, and the rain during the rainy season is not soaked up by the missing plants. This causes sedmintation, even mud slides, which bury villages and kill villagers. No one ever talks about the cause of the mudslides on the news. The cause is deforestation. Another indicator of a degraded environment is when rivers do not flow the whole year. One thing they did in Ethiopia, they make the gullies meander to allow a slower flow and the water infiltrate the soil. This also raised the water table. This is a physical change to aid restoration. The other change is biological, with the planting of trees. The amount and percentage of biomatter is huge. The determinate of ecosystems is the infiltration of rainfall water. He also feels that biodiversity is separate from the process of water retention. He says that we exist because of wilderness, and we need to nurture biodiversity for the possibilities. He also feels that we are not capable of making good decisions. He commented on the Copenhagen Summit. Two accomplishments were the setting up a carbon-trading scheme and the second was REDD (Reduction of Carbon Emissions by reducing deforestation). He has been publically speaking for 5 years and it is always accepted by every crowd that has watched his presentations. All cradles of civilization went through the same process. Cut down the trees, plant on slopes, leading to serious degradation of their environment. The wealth and power of a civilation leaves, but the peasant farmers stay for generation. One example is the Loess Plataue in China, the cradle of the Han people. Idea of canopies, not only the tree canopy and the grass canopy. There is a microclimate under the trees AND under the grass. You can click on the “Hope on a Changing Climate” link to see one of John’s movies. There is also a good website that will help educators use his ideas and work in their classrooms. The Environmental Education Media Project web site can help. His main web site is also full of more information. In Colombia there is a project called Las Gaviotas. They used a pine species to improve the pH of the soil and they are no pruning. I’ll need to look it up.